I see you, girl. Two birds, one stone! AND. Really because you have almost 1-year-old turkey stock in the freezer that you want to use up. Because, obviously. Youâ€™re going to make it again in less than 8 weeks. So, you grab your trusty Make It Ahead Cookbook by Ina, go to the store, and buy all the goodies to make Zucchini Basil Soup! Channeling all of the cool weather to get here NOW. This was me just a few weeks ago. Cooking is a favorite past time for both me and my husband, so itâ€™s hard to pass up a free evening of doing just that and enjoying a little extra time to myself! So, you get back home, and what are you next moves? For me, I saddle up with a glass of wine and put on my favoriteâ€¦ scratch that, current favoriteâ€¦ show on Netflix. Preferably one that my hubby is not into... just saying. Make the most of your time, girl! For me, on that particular Friday night, it was Supernatural! HA, donâ€™t you roll your eyes! Yes. I have the part of the series in DVD format! That was BEFORE there was such a thing as Netflix ðŸ¤£ Now you can get all 13 (and counting) seasons of Supernatural on Netflix! Side note: youâ€™ve got to try this series out. The 2 main hunks (theyâ€™re brothers in the show) alone will keep your interest ðŸ˜‰ As the title conveys, it is about the supernatural so youâ€™ve got to be into that kind of thing - weâ€™re talking angels, demons, and all the things in between (that youâ€™ve heard of and not heard of) that go bump in the night. ...Oh, what I was actually telling you about was my Friday night making Zucchini Basil Soup. Right. Letâ€™s get back to that! Overall, this recipe is super easy to make and there really isnâ€™t a whole lot to it or a lot of mess to clean up when youâ€™re done! I do get a little messy, but thatâ€™s just me. I like to measure most of the important ingredients out and when thereâ€™s chopping involved, I need my cutting board plus another dish or plate to hold the newly chopped goods ðŸ˜‰ Get ready for A LOT of chopping and make room on that counter! 3lbs of Zucchini this time around for me was actually 6 individual ones (see, I told you - itâ€™s a whole lot of choppinggg). I got 2 containers of Basil at the store because... 8oz (one container = 3oz and yes, I totally underestimated because I figured my calculations were wrong ðŸ¤£). You truly only need 1 container for what Inaâ€™s calling for. I picked 1 large onion - look for one thatâ€™s a little bit rounder and plumper than a tennis ball - and only needed to use half of it (thatâ€™s why I love to measure)! I'm no expert when it comes to chopping. I just kind of wing it! My culinary inclined husband would say I'm doing it wrong. But, do what feels right to you. 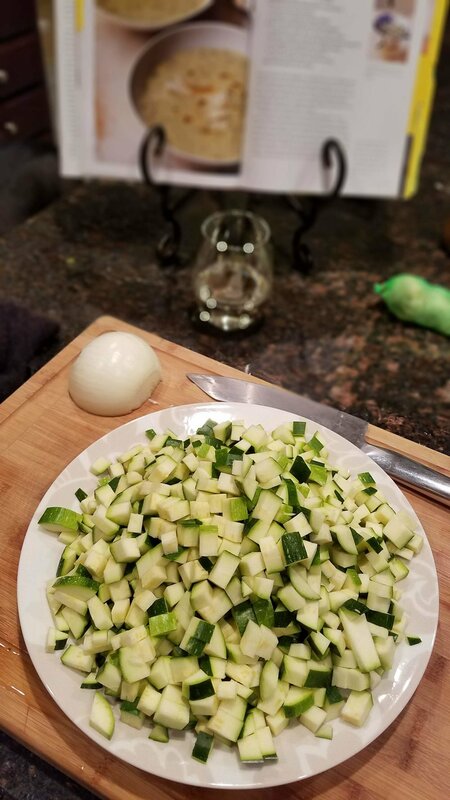 Don't get discouraged if you canâ€™t chop 3/4 of an inch of zucchini every time. HA. We all can't be as perfect as Ina. AND make it uniquely yours! Iâ€™m all about throwing in my personality and just doing what feels right for ME. My technique usually gets better as I continue to chop and chop and chop. First, slice the zucchini removing and discarding the very ends. Then what I did - stack about 4 zucchini circles high, cut lengthwise almost all the way through, and then do the same perpendicular to the cuts you just made. This was the easiest way I could think to do it. It is clearly not the food expert way ðŸ¤£ Check out this super easy how-to chop zucchini video that I should have watched first. 587 cuts later.... Voila! Your zucchini will be ready! I placed all of my chopped zucchini on a dinner plate and set it aside. Time for the onion! I could never explain to you how I chop onions. I learned from my talented husband. Hereâ€™s a super easy how-to from the real culinary experts. But, honestly, make this recipe yours and do what feels right to you! I used a small bowl to keep my chops and set that aside with the zucchini. Next comes the garlic! As long as you have a mincer, this one will be easy. Itâ€™s literally just the stickiest process! Make sure to keep a damp towel nearby. You're going to have to wash and wipe off your hands a few times! I usually lightly smash each clove with the side my knife to easily remove the papery skin. Basil time! Definitely a rough chop for this gal. Remember, 1 cup of basil is 1 container not 2 ðŸ¤£ I didn't know until now! Your welcome. Now that all the ingredients are preppedâ€¦ go make sure your wine is refilled! Okay, then itâ€™s time to follow Inaâ€™s easy cooking steps. Got it? Everything added and ready to go? Great! So, now weâ€™ve got 30 minutes to simmer. Iâ€™m saddling up with some more wineâ€¦. and perfect timing! The hubby just walked in. BRBâ€¦â€¦â€¦. Anyways, I gave in and added the half and half! It was just a slight poor after everything was off the heat. If you do this, let me know what you think! Okay, but really now, BRB. Hey girl, hey! It's time for the finishing touches! Depending on your blender, pulse on ice crush mode and then grind / chop until the consistency looks smoothe. Tip when using your blender - have a 2nd pot handy to transfer the newly blended soup. Our blender wouldn't hold all of the ingredients at once, so we blended in batches. And I donâ€™t know what Inaâ€™s talking about... Our soup still had lots of texture even with using our blender! What about you? PS. Donâ€™t let scary kitchen tools deter you from going for it. Thereâ€™s always an alternative option ðŸ˜‰ AND remember, pour some of your awesome uniqueness into it! Thatâ€™s half the fun. Copyright Â© 2018-2019 The Cheeky Assistant | The Cheeky Life. All Rights Reserved.